There may be no appliance in the home more important to you and your family than your water heater. Without reliable and plentiful hot water, it is difficult to wash clothes and dishes. Taking a bath or a shower is extremely uncomfortable when the only water available is cold. Keeping things clean and sanitized is crucial to a happy and uneventful life. When you face a future with no hot water, the answer is dependent upon whether you need to call the experts for water heater repair or shop and arrange for water heater replacement. If your water heater struggles, just taking its time to deliver, you may just need a tune-up or a cleaning. Call in an experienced Water Heater Service in San Tan Valley that has a track record of restoring equipment whenever possible. Water heaters may become very inefficient when they hold a lot of sediment from the mineral rich water running through your pipes. Draining off that sediment makes it easier for the element to heat the cold water entering the tank. Sediment also relates to corrosion of the tank itself. A magnesium anode rod inserted into the tank reduces the corrosion of the steel tank itself and a replacement of that rod on a regular basis prolongs the life of your water heater. Repair is not always the answer. A crack or hole in the tank is going to strongly suggest to the homeowner that a water heater replacement is in the very near future. Newer water heaters are more energy efficient and may save you and your family money over the long term. 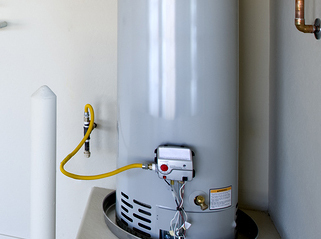 Call our reliable Water Heater Service in San Tan Valley today.